Sin caught up with Hanna Phelan from Suas to find out some information about an upcoming Global Issues Course which is starting up in NUI Galway on Tuesday 11 February. What is the Global Issues Course about? The Global Issues Course is a seven week evening course that provides students with an introduction to development issues. What issues will I learn about if I take this course? Each of the weekly sessions introduces participants to a different global issue. The topics covered include global health, trade and livelihoods, education, environmental sustainability, debt justice and taking action. The sessions are delivered by professionals from the relevant sectors and designed to be as interactive as possible. So if you feel a certain aspect of a topic should be explored further then you can choose to raise it. How will this course benefit me and others? The course has the potential to be beneficial to the participant, their family and friends and even the greater global community. There is a real emphasis of the change that can be effected by the individual. By participating you have the opportunity to expand your knowledge on global issues, your critical thinking skills and much more. With a heightened awareness in global issues and the effect that an individual can have many participants share this knowledge with their friends and relatives influencing them to act for positive change. Where do I sign up and how much will it cost? 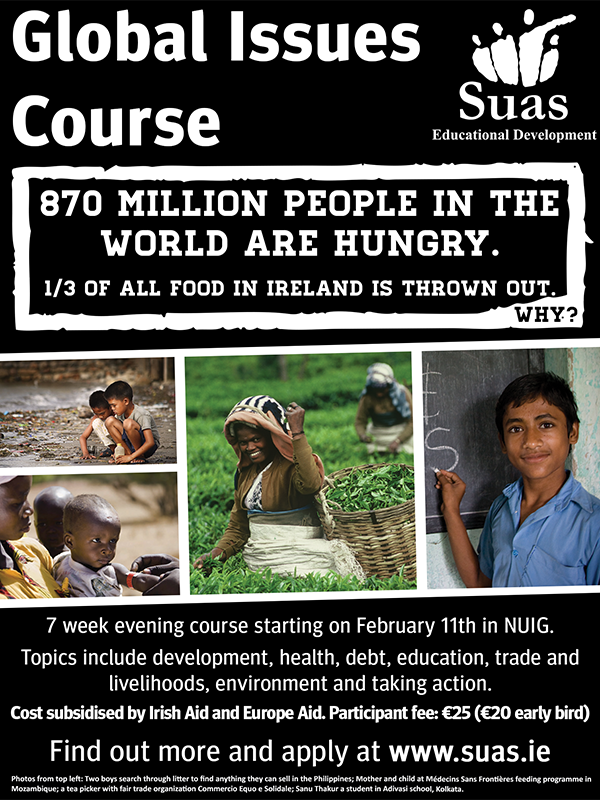 You can sign up for the Global Issues Course on the Suas website at www.suas.ie/take-course. The course it subsidized by Irish Aid and Europe aid so the participant fee is only 25euro. There is an early bird rate of 20euro if you sign up and pay online at least a week before the course starts. It’s worth is so much more than its cost! How else can I get involved with Suas in Galway? The Suas society in NUI Galway is a great place to start. Not only does it provide the opportunity to get to know likeminded NUI Galway students from a range of disciplines, but it also provides members with exposure to some really great projects. Last semester the Suas society was highly involved in the 8by8 documentary film festival and had the opportunity to work with award winning documentaries and film makers. Other great projects, that are open to society and non-society members, are the overseas and in Ireland volunteer programmes. Where can I find more information about Suas? If you have any questions about the Global Issues Course, volunteering overseas or volunteering in Ireland with Suas feel free to send an email to Hanna at globalissues@suas.ie. Or if you’re looking for a more general overview Suas you can visit the website at www.suas.ie. The Global Issues Course provides a great platform for people from any background, discipline or interest level to explore development issues with the help of professionals from the relevant sectors. If you are interested in perusing a career in an organization that is involved in these issues it’s also a fantastic chance to network. Hanna Phelan is a recent graduate of International Relations and French and a past participant in the Global Issues Course. Hanna is currently on a nine month internship in the Suas Educational Development office, Dublin.